Legionellosis is a respiratory disease caused by gram negative Legionella bacteria. At times, the bacteria cause a lung infection similar to pneumonia, known as Legionnaires disease. The bacteria is also capable of triggering a less serious infection called Pontiac fever, which shows signs similar to flu, such as fever, cough, shortness of breath, muscle aches, and headaches. These symptoms usually begin around one week after being exposed to the bacteria, though in some exceptional cases it can take longer for the symptoms to manifest. The global legionella testing market is anticipated to grow rapidly in the coming years. One of the key factors driving the growth of the market is the growing aging population. For instance, according to the World Health Organization (WHO), it has been anticipated that the global geriatric population, which was approximately 524 million in 2010, is projected to reach nearly 2 billion by 2050. Geriatric individuals are more likely to contract legionella infections due to their weakened immune systems, making the factor vital for the global legionella testing market. The global legionella testing market was valued at US$193.9 mn in 2017 and is likely to exhibit a robust 9.4% CAGR from 2017-2025, rising to a valuation of US$398.7 mn. By test type, the global legionella testing market is dominated by urinary antigen test (UAT), which is expected to hold a major share in the market in terms of revenue in the 2017-2025 forecast period, as it offers early diagnosis of the disease. The availability of advanced antigen detection facilities has driven the utility of the urinary antigen test to the global legionella testing market. By application, the clinical testing methods segment is anticipated to hold a major share in the legionella testing market. By end user, the diagnostic lab segment is anticipated to hold a major share in the market. The latter is driven by the steady rise in government investment in the healthcare sector in developing countries, which has led to steady availability of funding for medical research purposes. The rising private investment in the pharmaceuticals sector in developed countries is also crucial for the legionella testing market, as it has driven investment in diagnostic technologies. By region, the global legionella testing market has been divided into North America, Europe, Europe, Asia Pacific, Latin America, and the Middle East and Africa. North America dominated the global legionella testing market in 2016, followed by Europe. Asia Pacific is a rapidly growing market, but has a larger local market, which has eroded the profit margin of the global legionella testing market. Increase in baby boomer population and technological advancements are expected to drive the market in the next few years. The market in Asia Pacific is projected to expand at a robust 14.1% CAGR during the 2017-2025 forecast period due to rising awareness about legionella testing and adoption of new techniques, growing healthcare infrastructure, and rising medical tourism. The valuation of the Asia Pacific market for legionella testing is likely to grow close to threefold over the forecast period, with the market expected to rise from US$42 mn to US$121.1 mn. The North America legionella testing market is likely to dominate global figures, with the market’s revenue valuation likely to reach US$141.8 mn by 2025. Key players operating in the global legionella testing market are IDEXX Laboratories, Inc., Becton, Dickinson and Company, Thermo Fisher Scientific, Inc., Bio-Rad Laboratories, Inc., BioMérieux Inc., and Qiagen N.V. among others. This report on legionella testing studies the current as well as future prospects of the market globally. The stakeholders of this report include companies and intermediaries engaged in the manufacture and commercialization of various products as well as new entrants planning to enter this market. This report comprises an elaborate executive summary along with a market snapshot providing overall information of various segments and sub-segments considered within the scope of the study. This section also provides the overall information and data analysis of the global legionella testing market with respect to the leading market segments based on major products, key applications, end-users, and geographies. The market for these segments has been extensively analyzed based on their utility, effectiveness, sales, and geographic presence. Market revenue in terms of US$ Mn and market volume in terms of units for the period from 2016 to 2025 along with the compound annual growth rate (CAGR %) from 2017 to 2025 are provided for all segments, considering 2016 as the base year. The market overview section of the report explores the market dynamics such as drivers, restraints, and opportunities that currently have a strong impact on the global legionella testing market and could influence the market in the near future. Market attractiveness analysis has been provided in all the sections of the report in order to explain the intensity of competition in the market across different products/materials/end-users/geographies. The competitive scenario among different market players is evaluated through market share analysis in the competition landscape section of the report. The section also includes completion matrix that analyzes the competition among some of the top global players operating in the market. All these factors would help market players to take strategic decisions in order to strengthen their positions and expand their shares in the global market. The report on global legionella testing market has been classified on the basis of four categories: test type, applications, end-user, and geography. Global legionella testing market by test type has been segmented as culture methods, urinary antigen test (UAT), serology, direct fluorescent antibody test (DFA), and nucleic acid-based detection. By application the market has been segmented as clinical testing methods, environmental testing methods. By end user the market has been segmented as hospitals, diagnostic laboratories, clinics, others. 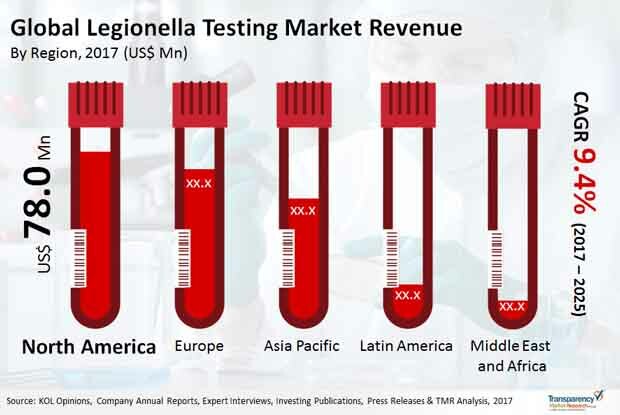 Geographically, the legionella testing market has been segmented into five regions: North America, Europe, Asia Pacific, Europe, Middle East & Africa (MEA), and Latin America. Each regional market for legionella testing has been further categorized into major product, applications, and end-user segments considered within the scope of the study. Key country (U.S., Japan, Germany, France, U.K., Australia, Canada, China, Brazil, Mexico, India, etc.) market revenues have also been provided in different regional sections within the report. Market revenue in terms of US$ Mn for the period from 2016 to 2025 along with CAGR % from 2017 to 2025 are provided for all the regions and nations considering 2017 as the base year. The report also profiles key players operating in the legionella testing market based on various attributes such as company details, SWOT analysis, strategic overview, financials, and business overview. Key players operating in the global legionella testing market are IDEXX Laboratories, Inc., Becton, Dickinson and Company, Thermo Fisher Scientific, Inc., Bio-Rad Laboratories, Inc., BioMérieux Inc., and Qiagen N.V. among others.